Hi again. It’s me, Marc Hershon, your host and Surgeon General for Epi109 of Succotash, the Comedy Podcast Podcast. 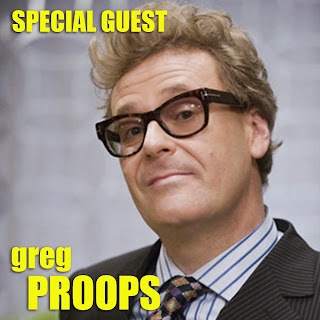 This was SUPPOSED to be a Succotash Clips episode but, along the way to doing that, I managed to get an interview in with Greg Proops, host of The Smartest Man in The World podcast and a veteran of TV’s Whose Line Is It Anyway. Greg's new book, The Smartest Book in The World, hits both online and bricks n’ mortar bookstores this week, so I’ve made a command decision to push back the clips for another week or so and put up this edition of Succotash Chats instead. As you will quickly discern, we were in a rather noisy Hollywood eatery — the King's Road Cafe — and I have done my best to filter out as much of the background noise as I could, but it’s still going to sound like you’re eating lunch at the table with us. It’s also a lengthy interview, so you’re probably strapping in for the longest Succotash show to date. Relax. And if you want to take it in over the course of several sittings, be my guest. Also this episode we've got a double dose of our Burst O’ Durst segment with political comedian and social commentator Will Durst. (Don't forget to follow Will on Twitter @WillDurst!) In the first he announces the official start of the Presidential Derby and in the second he goes off on what he calls "oversharers". This past week, for both Huffington Post and Splitsider.com, I reviewed Gilbert Gottfried's Awesome Colossal Podcast, with guest Lewis Black, recorded live at Caroline's comedy club in New York City. You can follow either link to that review and try to check out that episode if you can - it's pretty damn funny! Podcasts don't grow on trees nor do they pay for themselves. If you want to help keep Succotash growing and going, please click the Donate button at http://SuccotashShow.com and kick us a few doubloons. If you want to help us out a little more indirectly, you can click on the Amazon banner at the top of our page and when you buy something at Amazon.com, we'll get a little taste. We'll be back soon with Epi110, which will be a Succotash Clips show, chock full of comedy podcast clips from around the internet. In the meantime, thanks for passing the Succotash!